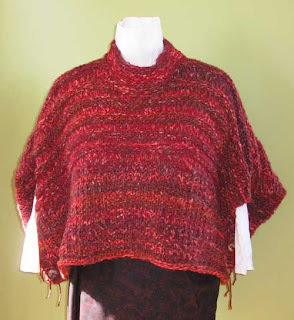 Fiber Antics by Veronica: What can you do with rectangles? My Beginning Knitting students are making great progress! The last class meeting is next week and I'll be including inspiration and ideas for projects a beginner knitter can accomplish. Here is a project that I just completed using Cathy Payson's Colorful Cropped Overlay pattern, that I think an enthusiastic beginner could do. I'd call this piece a "Mailbox Wrap"— something you could throw on during these cold winter months when you have to run out to the mailbox. 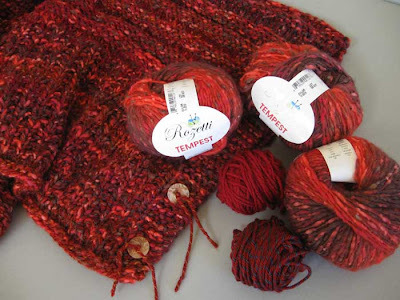 I had several balls of self-striping Rozetti Tempest (by Universal Yarn) in spicy reds that would be warm, snugly— and spicy— for this wrap. As the pattern called for a chunky yarn (10 sts = 4"), I married the #4 worsted weight, thick/thin, fuzzy Tempest with assorted smoother red wool blends from my stash. changed the seed stitch pattern on the lower section to a 2-row modified rib (Row 1: knit. Row 2: p1, k1.) The effort put forth using the seed stitch pattern would have been lost with the textured Tempest yarn. added additional RS knit rows to the ribbed section on the top. shortened the collar. Also knitted it in the round. left long yarn tails from the button ties to create a design detail. This pattern is basically two big rectangles with a collar that could be knit by picking up stitches (per the pattern) or knit separatley as another rectangle and sewn on. I have a few balls (50g/120yd) of Tempest remaining. Maybe a slouchy red hat to match??? What do you think? It was so good to meet up with you again, Jane! Glad you enjoyed the class and I'm looking forward to Knitting II. Keep up the good work!